In the United States it is considered impolite to bring up the subject of genocide when discussing the expansion of the country from the 13 colonies to the 50 states. There are certain aspects of our history that we deem taboo when talking about or discussing in school. The mere mention of the Native American Genocide can end a conversation at a moments notice. In this aspect it is considered civil to overlook the suffering of an entire race of man. In this light it is impossible to recognize the deaths of millions of human beings that at the time the United States deemed "undesirables". Over the years the Native American has been cast as the "Noble Savage" that just happened to be here when the Europeans arrived. History books are ready and willing to discuss the brutal battles as along as the white man is portrayed as the underdog rising up to the challenge. We aren't meant to look at how disease, firearms, and religion were used to subjugate and ethnically cleanse entire states. That would be uncivil. This desire to whitewash history has plagued us for far too long. It has infected our society when it comes to dealing with anything unpleasant. Especially when the issue of genocide comes up. Genocide, after all, is the most uncivil issue history has to offer. 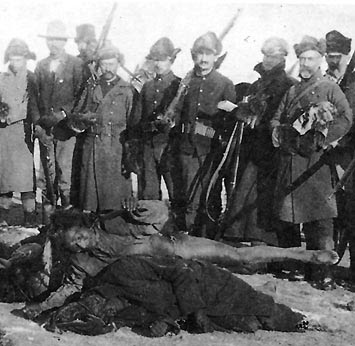 For over 120 years the massacre that occurred at Wounded Knee has been described by historians as an epic battle. This tragic result of American genocidal policy has been portrayed as the last real battle against the uncivilized West. And it is in this caricature of history that we loose the reality of what actually happened at Wounded Knee. It is in this sterilized view, this polite and civil view, that we fail to issue blame to whom it is rightfully deserved and to recognize the dead and their plight. There was no battle at Wounded Knee. There was no struggle between militants. And the underdog in this fight had absolutely no chance to rise up and meet its opposition face to face. What happened at Wounded Knee was genocide. Civility dictates that we don't call it that however. Civility dictates that we remain polite and look at this tragedy "objectively". And that is where humanity fails. This is where the world fails to recognize just how far from reality we are when it comes to genocide. The same policies that led to Wounded Knee exist today in several countries across the globe. Burma has been engaged in this horrific crime against humanity for decades when dealing with the Rohingya people. Sudan has been embroiled in these same policies in Darfur for almost as long as I have been alive. And when looking at Syria one can draw the same parallels and show just how Assad's regime is embarking on the same path as the United States did when dealing with the Native Americans. In Indiana the Native Americans were effectively surrounded as the "Indian Territory" was engulfed by newly formed states... white only states. Starvation and the implementation of the factory system helped to diminish the numbers of Native Americans within the Indiana Territory. When native peoples refused to engage the white settlers the militia and United States military were called into to goad the Native Americans into conflict. Nearly every battle fought in Indiana against Native Americans was a direct result of United States policy of antagonizing the Native Americans and then attempting to annihilate the tribes that responded. For the Sudanese of Darfur this part of America's history has been playing out all around them. The government that the colonialist left them was flawed in regards to the peoples and the customs the new state embodied. 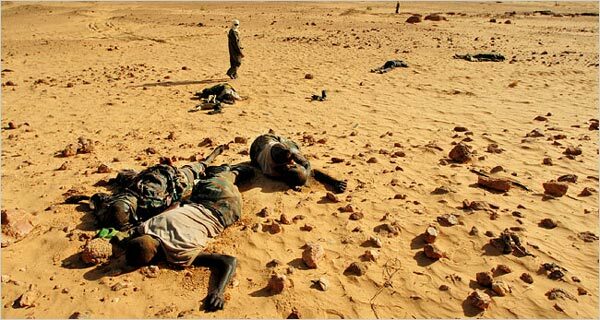 When the Bashir decided to cease antagonizing the people of the Darfur region the slaughter began. Much like the Indiana Rangers, the Janjaweed carry out the genocidal ambitions of their ruler. 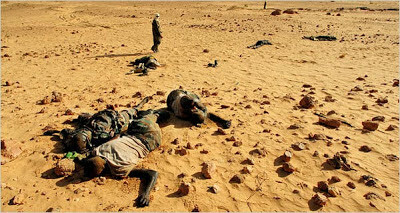 For those trapped in Darfur the reality of their situation is far from civil. Yet to talk about it back here in the United States is either at times impolite discussion or chic depending on who you are talking too. Ironically, no matter who you are talking with, the comparison of Darfur to the genocide of the Native Americans here in Indiana is always considered uncivil. 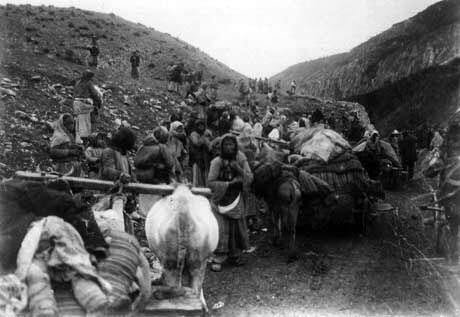 The most direct comparison to genocide carried out by direct orders of the United States government to a genocide carried out by a foreign government would be the Armenian Genocide. The United States had a direct link to the Armenian Genocide in the fact that our ambassador the the Ottoman Empire recorded the genocide as it took place and reported back to the United States as it occurred. Now at the time we had no word for the genocide. That term would be invented only after the Holocaust. But we did know that the Armenians were being killed off in a campaign to exterminate them as a whole. And yet our government at the time viewed this horrific tragedy as though it was not of concern to them or the United States and its people. The irony of the situation was however unclear at the time when talking about the American public as a whole. Even though Americans in general were well educated about the Trail of Tears that followed the Indian Removal Act of 1830 they were ill informed when dealing with the Young Turks. The failure to make this link then could have come from many things. However the more relevant reason for the given period in American history would have obviously been that it was impolite to make such distinctions. One can only imagine how the public would have reacted if the New York Times had run a story comparing the declarations given by the Young Turks to the legal decree issued by the United States in 1830. Sure a decent amount of time had passed between 1830 and 1915. And sure the people alive for one genocidal deportation might not have been alive to see the Armenians' plight. But that wouldn't have made the effort to link the two any more less civil then than it is considered to be today. The facts behind the Trail of Tears and the forced death marches of the Armenians are the same. The goal of each government was the same. Both were genocidal efforts to destroy and or deport an entire ethnic group. And both were supported by government leaders and carried out by military thugs. Perhaps it is the perceived impoliteness of the subject that has hindered us from recognizing the Armenian Genocide for so long. In many genocides the dead are often justified by the fact that they decided to fight back. In Armenia the Turks to this day make that assertion that the Armenian Genocide was simply a product of war. To the Serbs the Bosnian Genocide was not actually a genocide against the Bosnians but rather a direct result of the Bosnians committing genocide against the Serbs. Yet in both cases those who try to justify the deaths of their victims we as a world community know who is lying. When looking back at battles such as "Custer's Last Stand"... aka Little Big Horn... Americans often view the fight in much the same way as Serbians look at Srebrenica. The perversion of history through a slanted view of it helps the the victor rationalize the deaths of their vanquished. It allows the conscience of a nation to come to terms with a war in which the ends somehow were meant to justify the means. For the Rakhine people in Burma this perversion of history is well under way. Leaders that the West looks up to, such as Suu Kyi and Thein Sein, are allowed to twist the facts of what they are doing in the Arakan to make history lineup in their own shadows. It is only when outsiders call them out on their policies of ethnic cleansing that this perversion of history becomes "impolite". As for the Rohingya, the West along with the United States is already viewing them in much the same way as we view the Native Americans today. "Nobel Savages" somehow translates into "the world's most persecuted people" in this modern age. We don't allow ourselves to call someone the "vanguards of the old world" and yet we allow them to be killed off by the new world. After all, it would be uncivil for us to view the Rohingya in any other light. And it is this exact flaw in our society that hinders us from taking action. It is the paralyzing fear that if we address genocide as it occurs today we might have to face the sins of our own past. We don't allow ourselves to be honest when talking about genocide because guilt still lingers where it should have been wiped away. We will never be able to attack genocide in the way it deserves until we are able as a society to accept our own dabblings in it. We must first come to terms with the sins of our fathers and those who came before us. We must accept history for what it is. For if we can not we will never learn from what it has been trying so desperately to teach us. Excellent post, Jack. The comparisons you made between the Native Americans and the Rohingya brings the situation closer to home, for me. The justifications and the abject refusal to acknowledge the travesty taking place is appalling. As with the Native Americans and Armenians, the history books will be writen in favor of the victors and edited by the agenda of the most popular politicians. History does indeed repeat itself. If more people knew, would they be numerous enough to stop it?? That is our hope, and I believe that is the reason you project this message to the world. You, sir, are opening people's eyes to the unseen pains of what many throughout history have endured and fallen to; Genocide by their fellow man. Keep screaming. New ears will hear, and they will scream with you. We can be loud enough to make a difference.